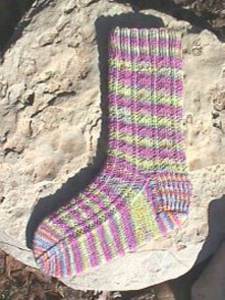 Wildhorse Farm 4 ply sock knitting pattern for ribbed Monkey Bar Socks with stockinette and kitchener stitches to fit medium to large adults. 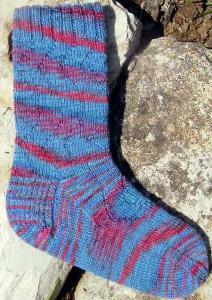 9 sts (8sts) per inch in stockinette stitch worked in the round on 2.5mm needles. 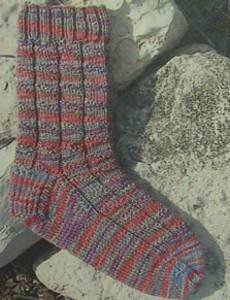 Survivor Sock and Lapel Pin knitting pattern from Wildhorse Farm for 4 ply socks to fit medium and large adult sizes and a 4 ply Lapel PIn with a mini matching sock. 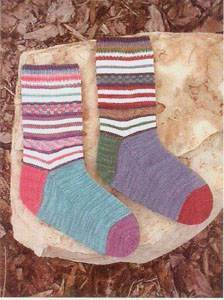 Which Way Socks 4 ply sock knitting pattern from Wildhorse Farm designs to fit medium or large adult sizes. 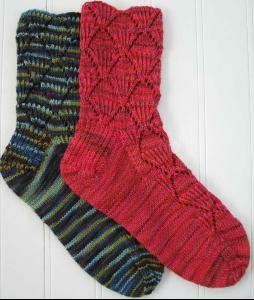 Thong sondal socks with a split toe socks that you can wear with thong sandals, or just because you want to. 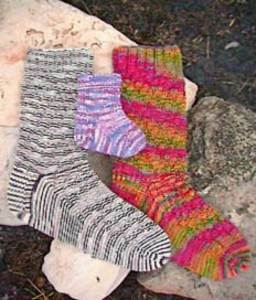 Thong Socks are often referred to as tabi socks after the sewn version used in Japan. 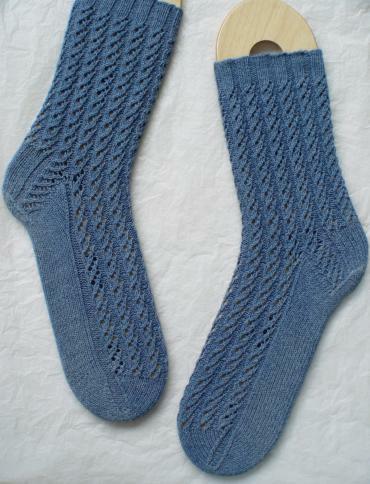 These HeartStrings Parting Ways Socks are a dressy pair of socks, with a swirling eyelet rib pattern that parts ways at the juncture of heel and instep with a column of the pattern extending downward on each side. 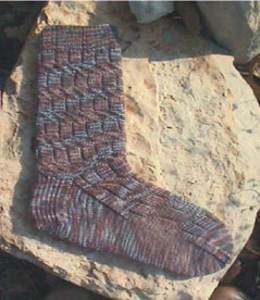 Wildhorse Farm 4 ply sock knitting pattern Metropolis with textured trellis design to fit adults medium or large, on either 2mm or 2.5mm needles. Tension 9/8st to 2.5cm. 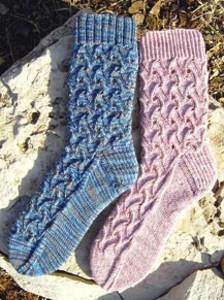 32 row pattern - experience and/or patience recommended! 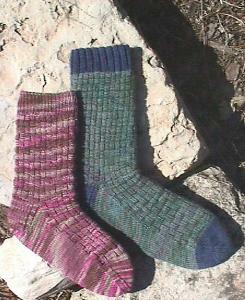 100g sock yarn. 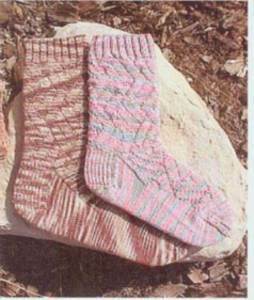 Wildhorse Farm Isosceles 4 ply sock knitting pattern with textured triangles designed by Lisa Parker to fit adult medium or large on either 1.5/2.5mm needles. Tension 9/8sts to 2.5cm. 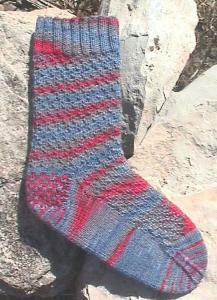 Requires 100g sock yarn. 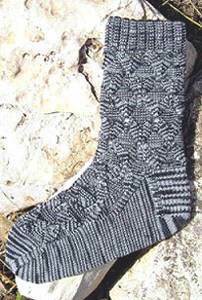 Wildhorse Farm Zig Zag charted lace 4 ply sock design by Lisa Parker to fit adults medium or large on either 1.5mm or 2.5mm needles. Tension 8-9sts to 2.5cm. 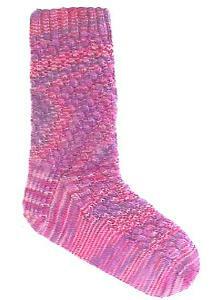 100g sock yarn. 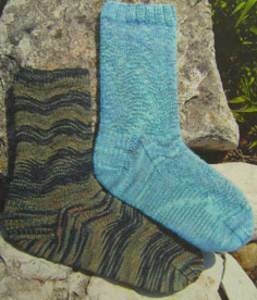 Wildhorse Farm Parallel Socks 4 ply sock knitting pattern with a simple textured design to fit adult medium or large (64/72st cast on). 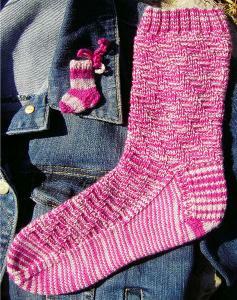 8st to 2.5cm, 2.5mm needles. 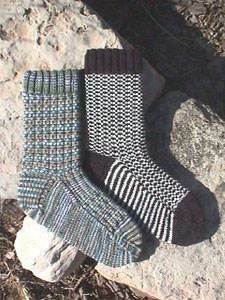 Steppin Out Socks is a Wildhorse Farm design which uses up ends of sock yarn. 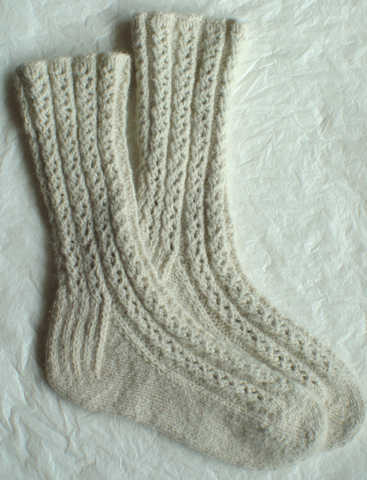 Fits adult medium or large on either 2 or 2.5mm needles, plus a smaller size for ribbing. 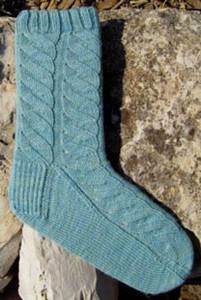 Wildhorse Farm Penllyn Socks 4 ply sock knitting pattern offers a fresh perspective on cables and fits an average medium/large adult, on either 1.5/2.5mm needles (or go up a size for a stretchier fit). 9/8sts to 2.5cm. 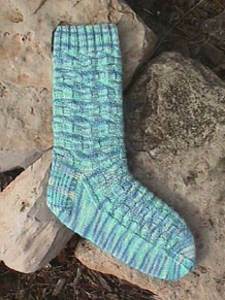 Wildhorse Farm 4 ply sock knitting pattern Rococo Socks with a textured lace design in 2 sizes (smaller and larger needles) to fit adult medium and large. Tension 8/9 sts to 2.5cm, 1.5mm/2.5mm needles. 100g/430 yds sock yarn. 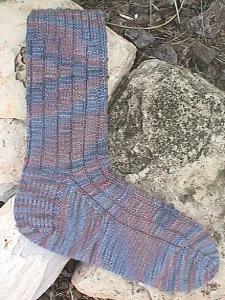 Savannah Socks is a Wildhorse Farm DK sock knitting pattern with a simple 4-row repeat can be knitted in 4 ply or DK yarn. 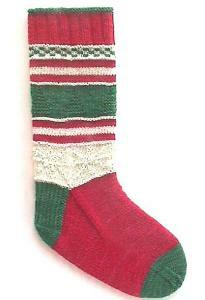 Fits adult medium or large: 1.5/2.5mm or 2.75/3.25mm needles. 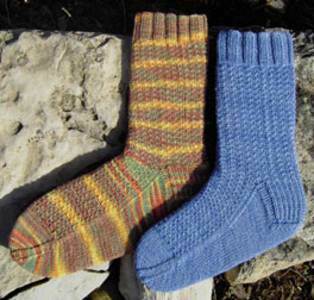 Switchback Socks from Wildhorse Farm have sculptural design and fit medium or large adults depending on needles and can be knitted in either 4 ply sock yarn or DK. Needle sizes 2/ 2.5mm or 2.75/ 3.25mm. 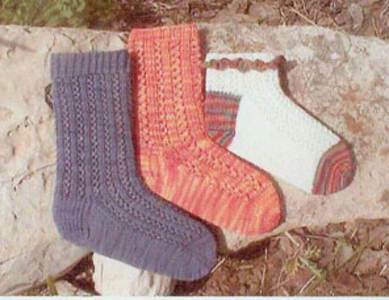 Wildhorse Farm Three Bears Socks is a 4 ply sock knitting pattern for Mama, Papa and Baby Bear (0-6mths, medium and large adult sizes). 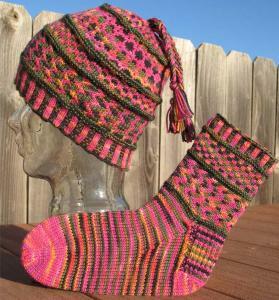 Can be knitted in either 4 ply sock yarn (tension 8-9 st to 1in, 2-2.5mm needles) or US sport weight ((6-6.5st to 1in, 3- 3.25mm needles). 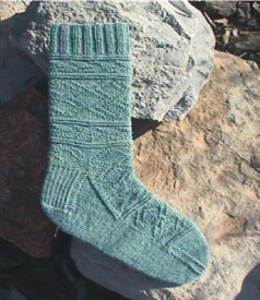 Wildhorse Farm Garland Lace one size 4 ply sock knitting pattern by Lisa Parker in shell stitch - elastic enough to fit most adult sizes. Approx 100g/430yds sock yarn. 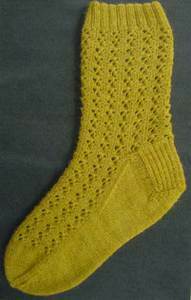 8.5sts to 2.5cm, 2.25mm needles: 2mm needles for heel. 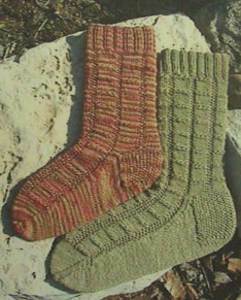 Wildhorse Farm 4 ply sock knitting pattern Ribbit Socks with a broad rib with a raised diagonal stitch to fits adult medium or large. 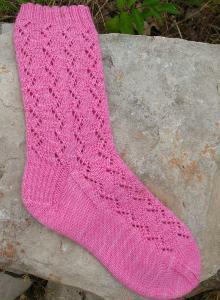 Tension: 32-36st to 10cm and requires 100g 4 ply sock yarn, 1.5mm and 2.5mm needles. 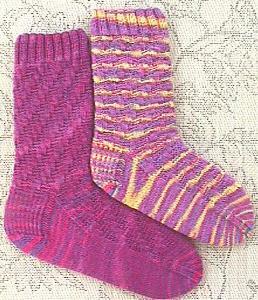 Wildhorse Farm Check Waves 4 ply textured sock pattern by Lisa Parker in knit and purl. 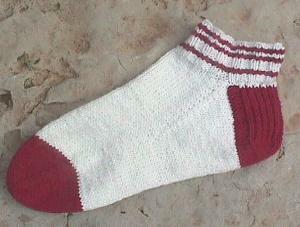 Fits adult medium or large on 2.25mm needles, 8st to 2.5cm. 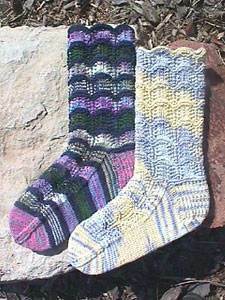 100g sock yarn.